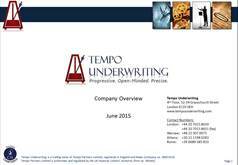 Tempo is a young, dynamic and fast-growing underwriting business. Our vision is to grow Tempo Underwriting into an international, multi-line underwriting agency in specialty lines which outperforms peers in underwriting performance and is recognised by capacity providers, brokers and clients as a partner of choice for being flexible, responsive and innovative. Our values reflect the way we work and behave, and are at the core of everything we do. Service Excellence – We strive for excellence in all areas of the business to deliver the best service possible inside and outside the company, whilst continuously monitoring and improving the quality of our performance. Empowerment and Accountability – We empower our people to make informed, on-the-spot decisions for which they take ownership as well as responsibility for their actions and decisions. We maintain a flat organisational structure where underwriting heads have P&L accountability. Integrity – We focus on doing business the right way for our clients, colleagues and business partners, continuously building on our reputation of trust, quality, professionalism and experience. We work hard to be open, honest and responsible at all times. Innovation – We encourage our people to develop unique and innovative solutions that enhance our products, services and processes and add value to customers and partners. Information Centric – We proactively employ IT and data services to originate business, better assess, select and rate risks, handle claims, and administer policies and accounts from client to broker through to insurance carrier. Underwriter-Led Business Model – Strategically, we focus on specialty lines business with niche propositions, led by underwriters with specialist expertise who are committed to service excellence. Virtual Insurer – We see ourselves as a virtual insurer who underwrites on others’ balance sheets and treat our capacity providers’ capital as if it were our own – exercising the same underwriting discipline and protecting capital. Partner with Capacity Providers – We collaborate with our capacity providers, rather than compete with them. We focus our energies on building distribution to access risks that capacity providers would not otherwise see.